After finishing my Empire army I have turned to chaos. 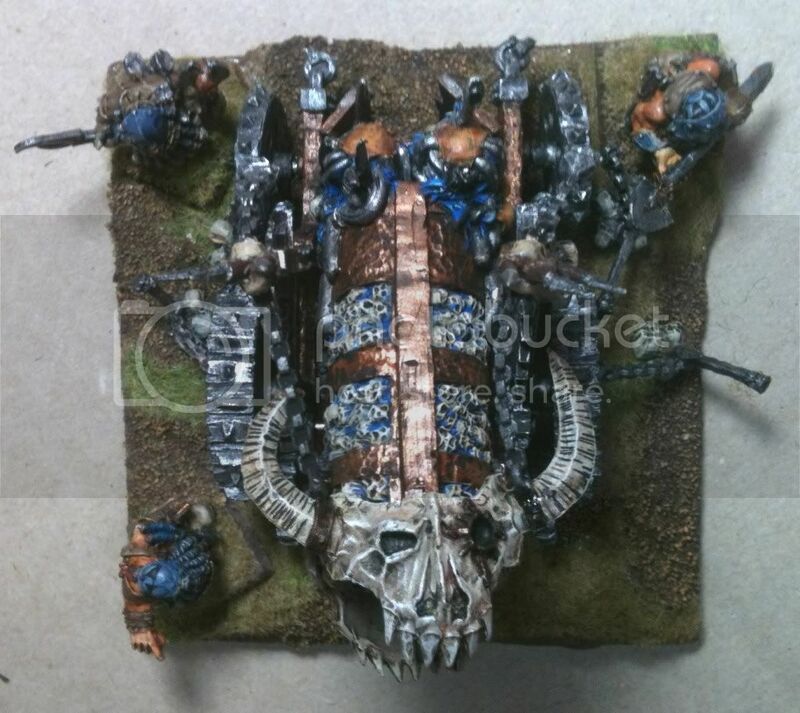 Back in 7th Ed I had a fully painted mixed army, some flying daemons, centaurs, and warriors. With the release of the WOC book my army did not run any more. So I have had to rebuild and add. Lord Char had led this army on many great victories and now needed to sit back and watch and he has yet to take to the field in 8th ed. Firstly I needed some warriors something I did not run before. 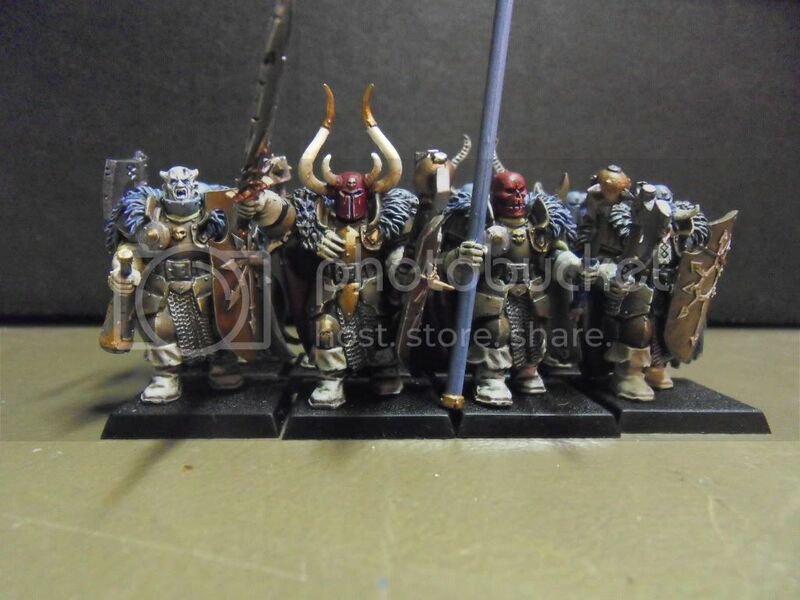 I had some very badly painted old warriors. 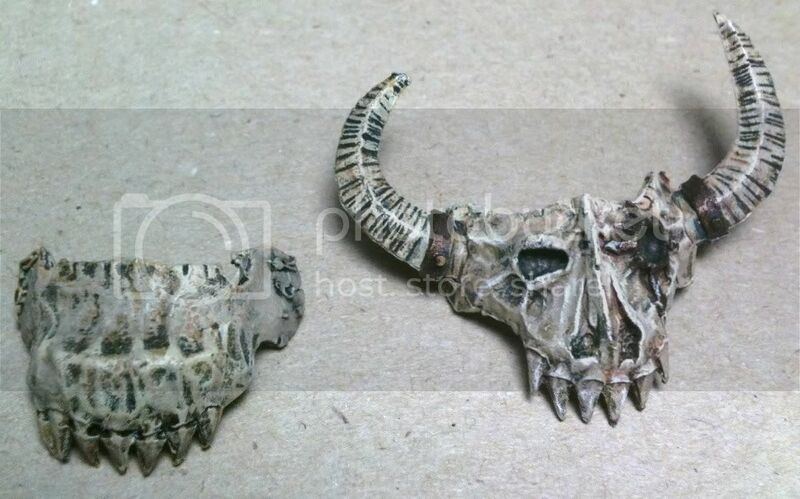 They were the first models we ever brought, I can remember spending a Christmas holiday painting them. They were red and gold, looked like crap and did not rank. So after pulling them out and doing several test paints I was still unhappy. 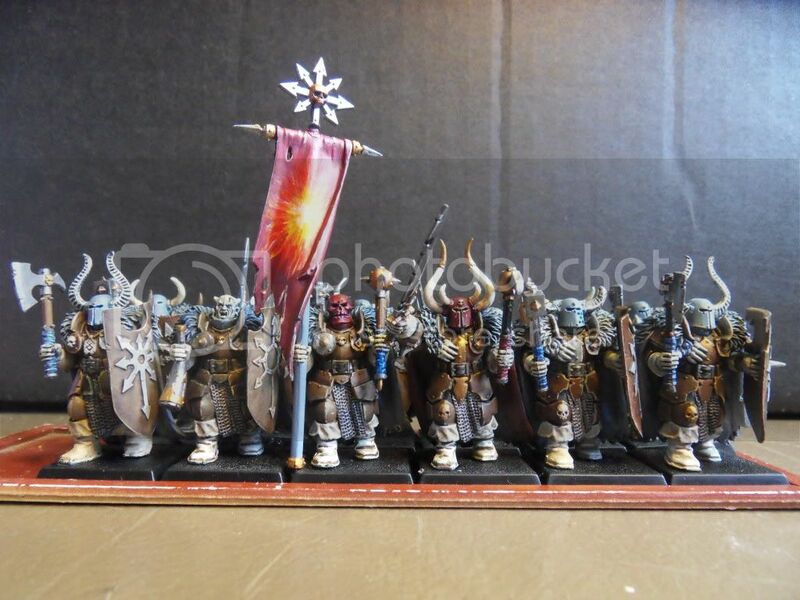 Eventually I had enough and so decided as I ran a nurgle unit with halberds that they would be them so the colour was green. I had just brought the foundation green so I started painting added the gold highlight and loved it. Some days you just have to put paint on the model until you are happy. 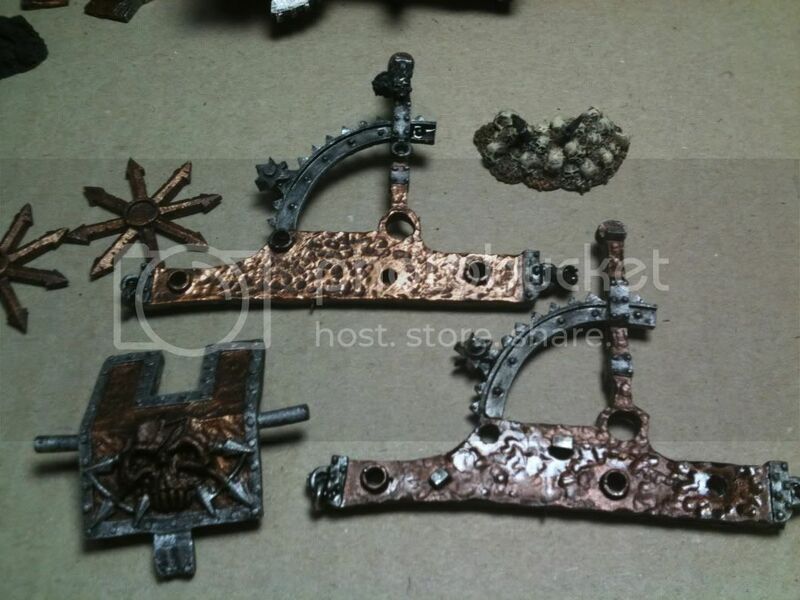 I broke every model down to its parts, thank heaven the glue was very old, and rebuilt them all so they would rank. 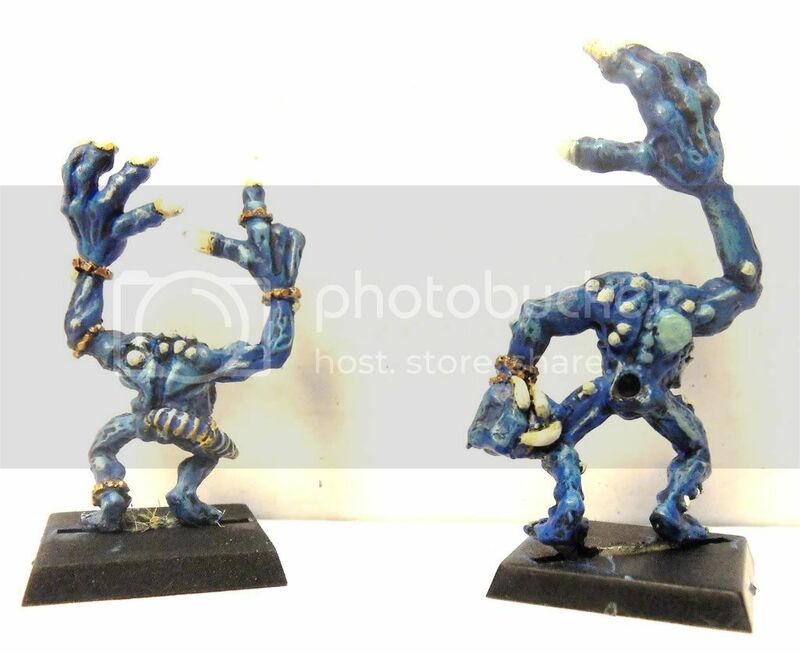 I blue tacked the models first to ensure I was happy with the results. Here are the results I hope you like them. I also added a new drummer I picked up at BIG March. I added a few mutant bits which were still on the spew. They sit on the flank so they are more visible. 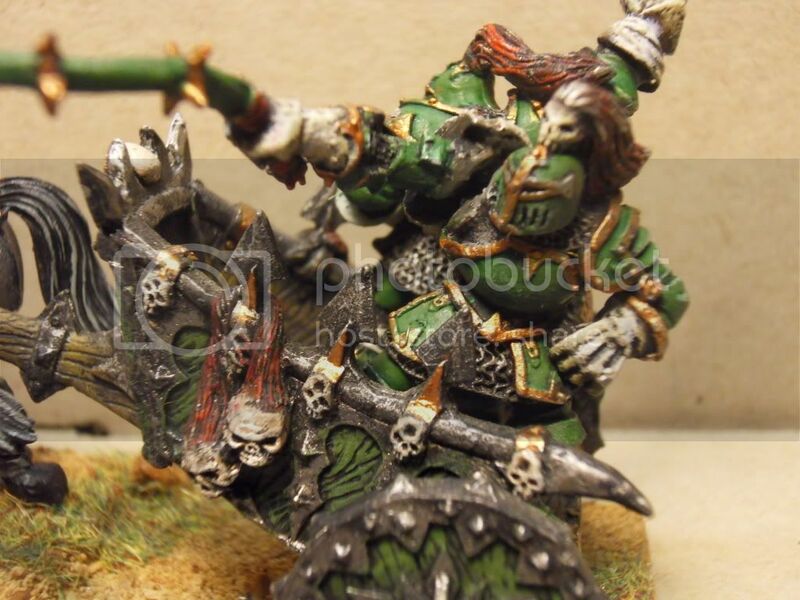 I gave one guy a white head and washed him green, very happy with the result. I have not yet done the banner because I am not very good a free painting so I just keep putting it off. It will have to be done soon though. 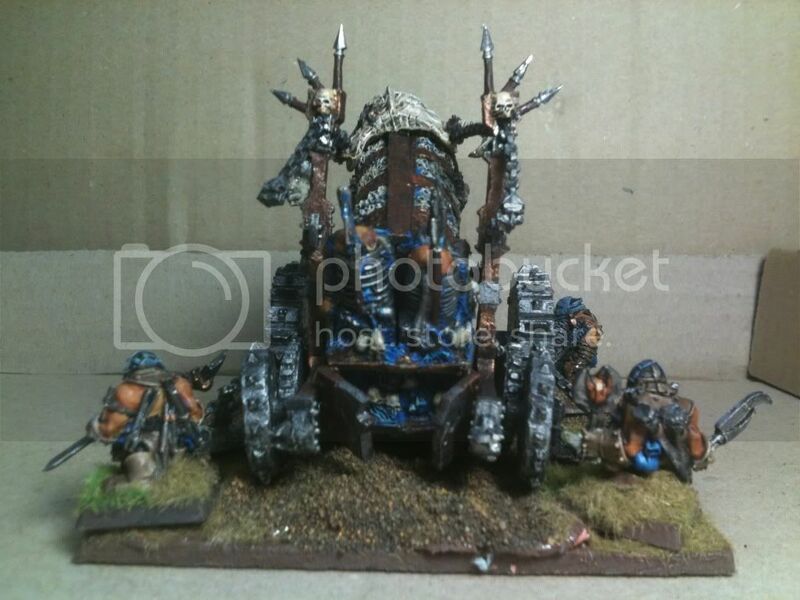 They tend to have the frenzy banner that�s why the base colour is red. Another thing I am considering is adding some more washes. 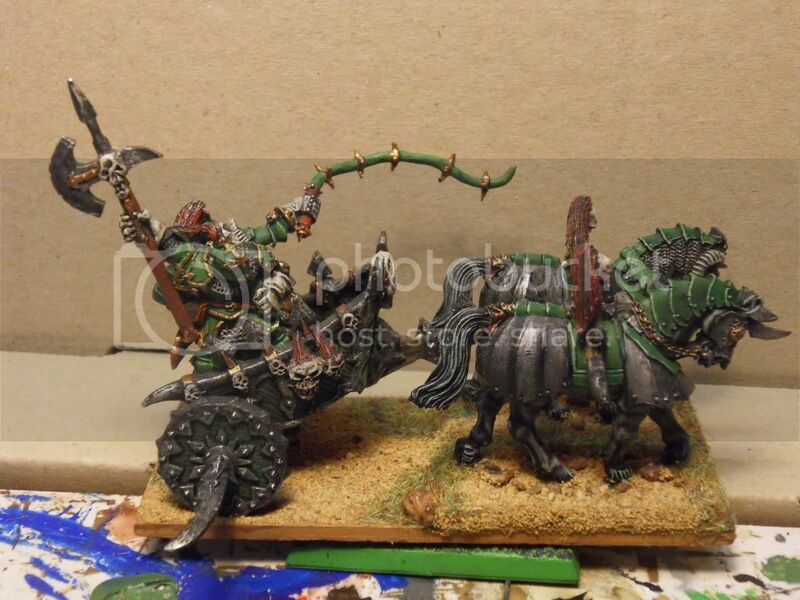 I have green washed the armour but I am thinking of also washing black or devlin mud to add some more depth. This worked wonders with the tz warriors below. 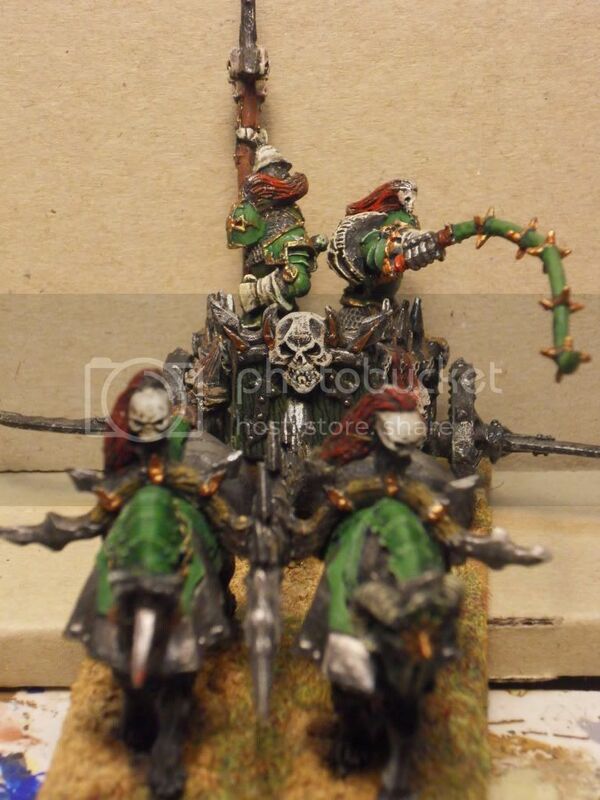 Next will be another unit of warriors, I run these as Tz with the blasted std. 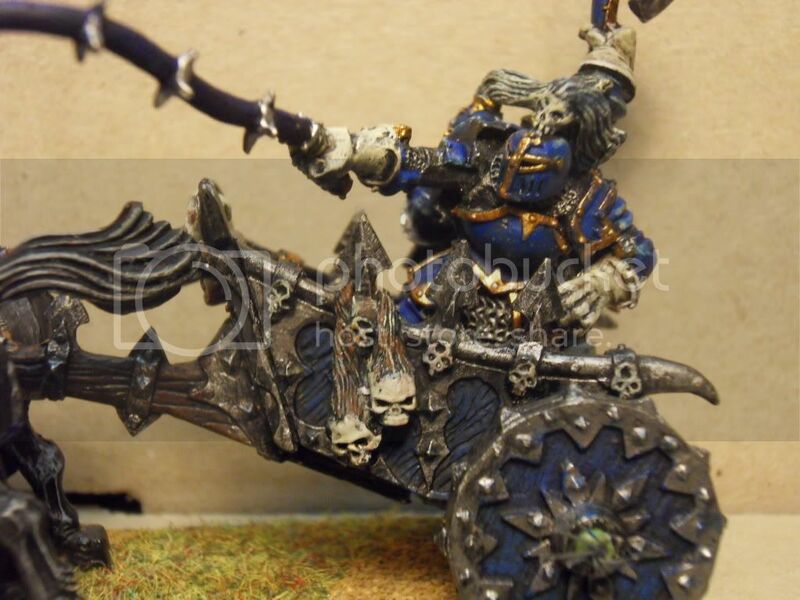 I am however over painting blue after my Nordland empire army so I needed another colour scheme. I chose a colour I have not used on troops before first painting a couple with bestial brown and shadow grey coats, but I was not happy even after I added washes. The washes did make them look O.K. but did not inspire me to paint any more. 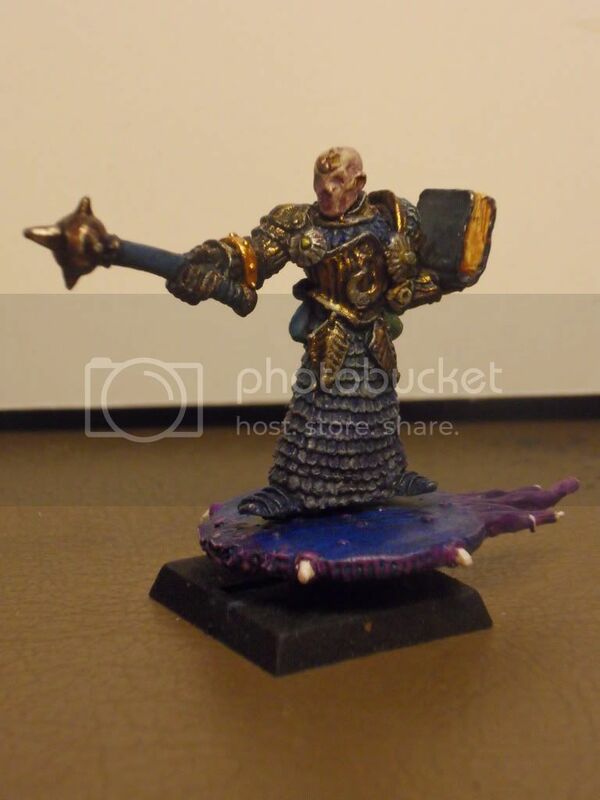 So I painted one graveyard earth and washed him and that worked. 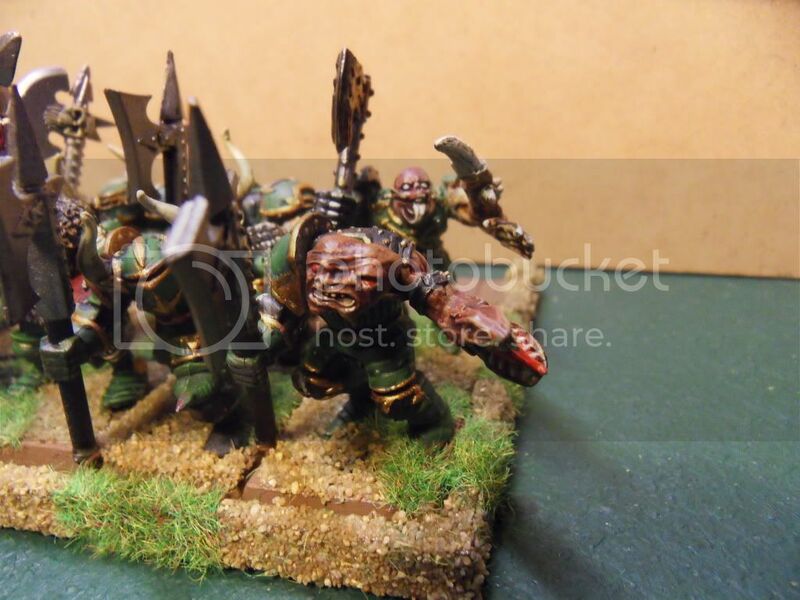 In the unit you can still see the bestial brown models but it added to some variety within the unit. I also have varied the capes from black grey to blue grey. Again I have done nothing with the std. The next little highlight was to give the command red helmets. The std has no shield as I find they cover too much of the model. The unit champ has had his shield on the side and I gave him a second weapon. This makes him even more deadly. I still have three more models to finish, and the basing. I will add more photo�s when they are done. At this point all the arms and heads are only blue tacked until I am happy with the unit. My next job will be a juggie, but that may take forever as I still haven�t picked a colour scheme. I like the red helmets on the command group, they contrast nicely. 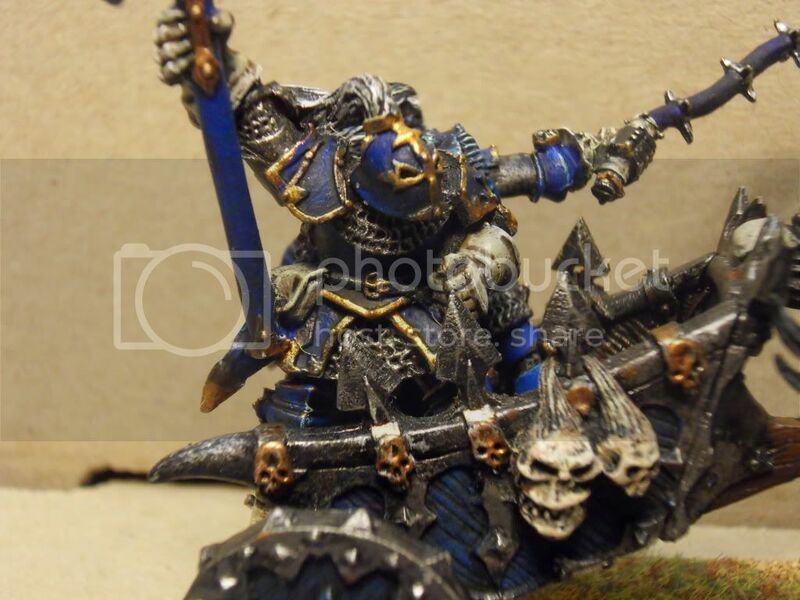 Also like the colour of the shields, though my eyes are really drawn to the boots, maybe darken them a little? 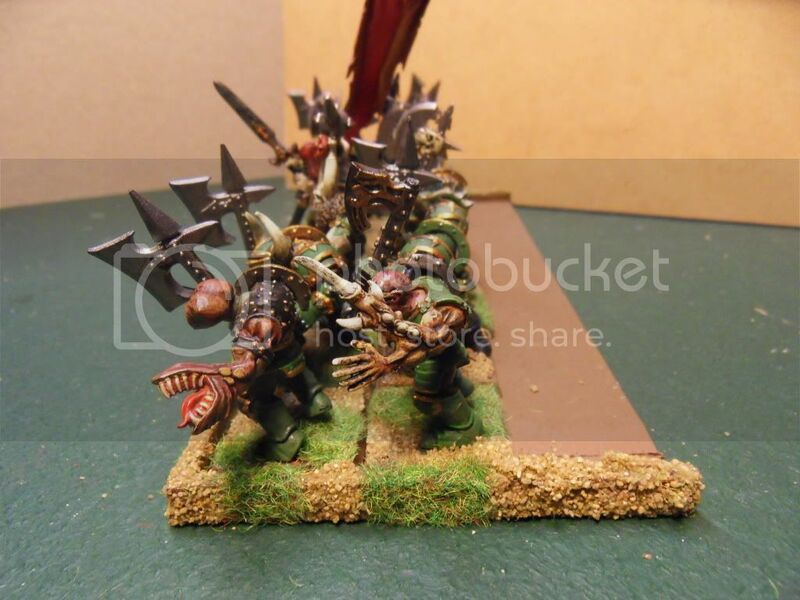 My Miniature Painting & Wargaming Crusade! 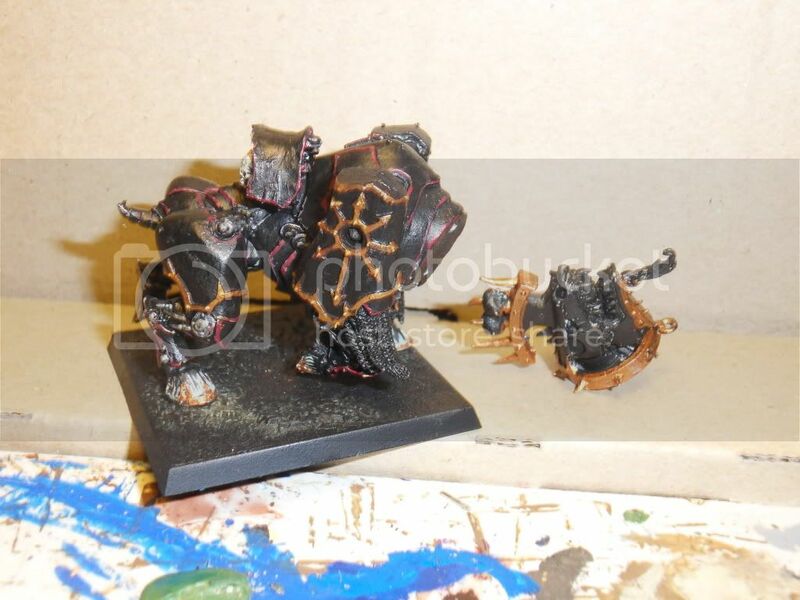 Care to share how you acheived that effect on the shields? Well I have finished the unit and done something I have never done before. That is finished the banner as well. 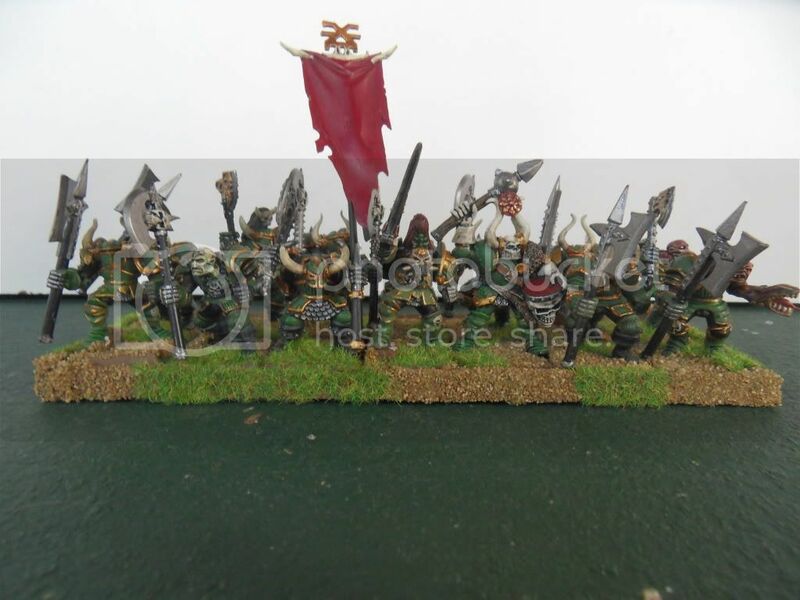 I haven�t based the unit yet because I am considering rebasing the whole army, but I haven�t thought what it might be yet. 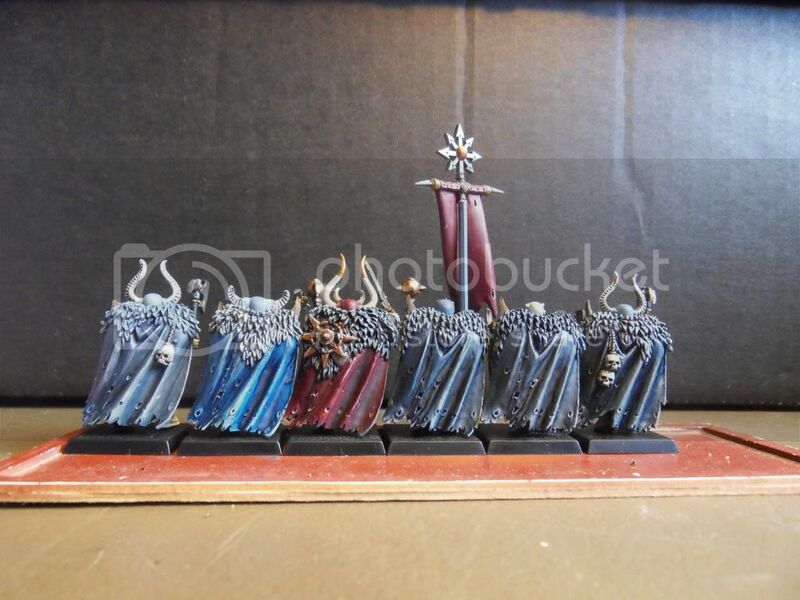 The shields are painted graveyard earth, let dry and them repainted. While still wet I add some white to the centre and blend it out towards the edge. The chaos stars are painted grey and edged in white. I then wash it with devlin mud brushing in towards the centre. I really only want it to highlight the stars in the centre. When that dries I wash again with a more heavy wash and brush out towards the edges. I want it to gather on the edges to give the contrast. 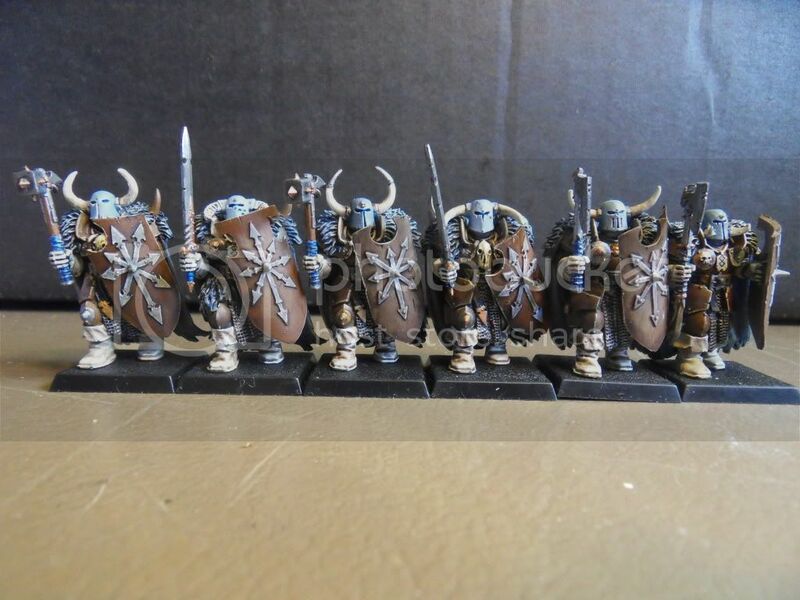 While these guys are HW&S I find the shield covers too much of the models details so for the front rank I have angled the shields to the sides so the details are more visible. 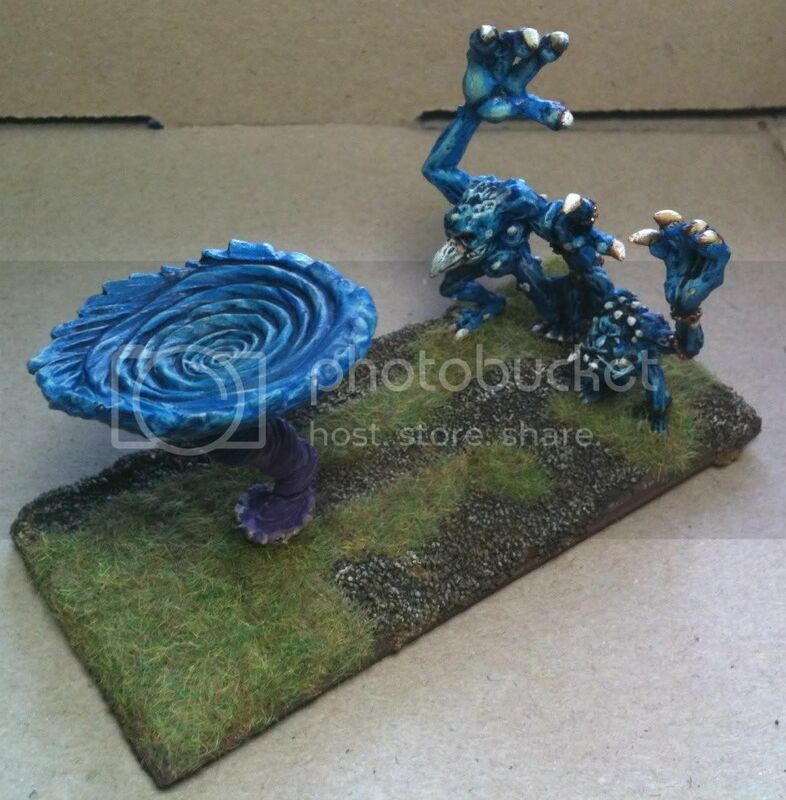 I usually run them with the blasted std so I have painted a fireball. It does not show really well in the photos but I like it. All of the caps are washed in blue but it is not really evident in the photos. I�m not really sure what I will do next I�m flued up so the creative juices are not the ones that are running. 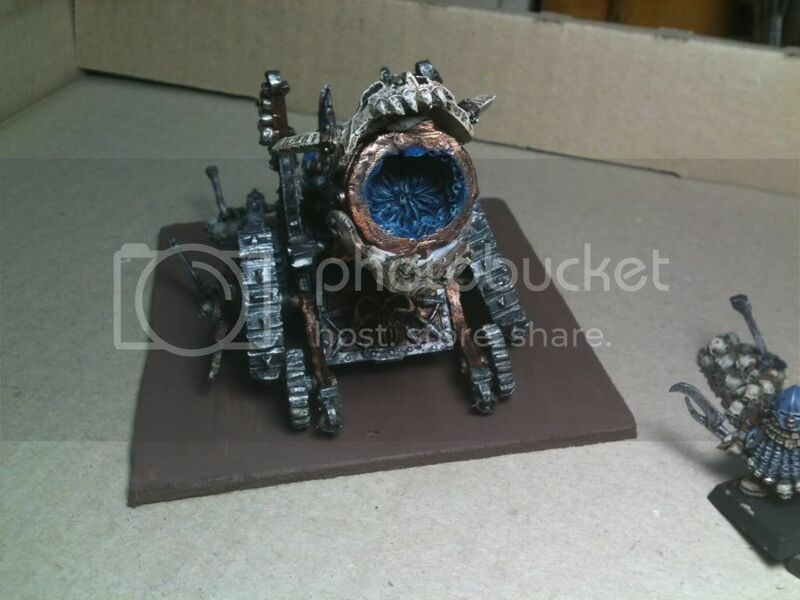 So next up was supposed to be the jug but I�ve been fluy lately and the creative juices have been lacking. In the end I just coped out and went black and gold. I like the b&g and each unit is tending to be a different colour. So here is what I have so far. 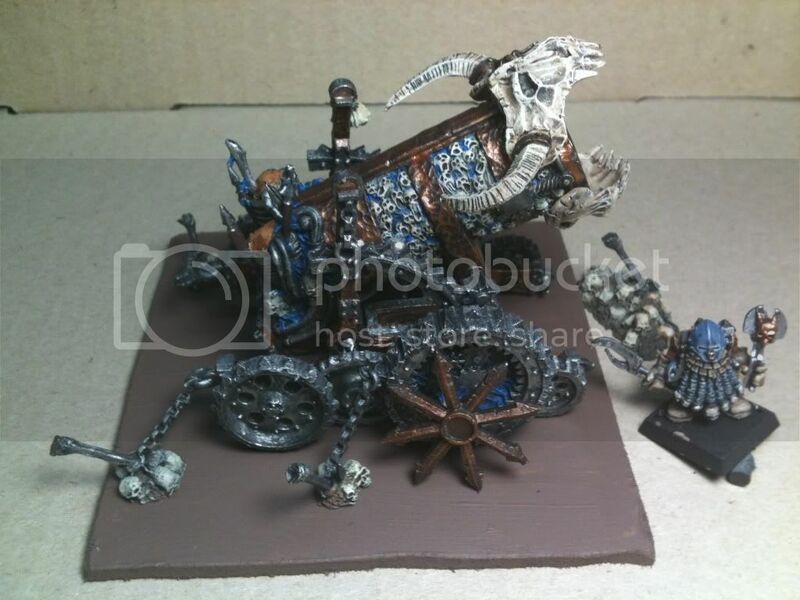 So while I was sitting not getting anywhere with the jug I started repainting the chariots. 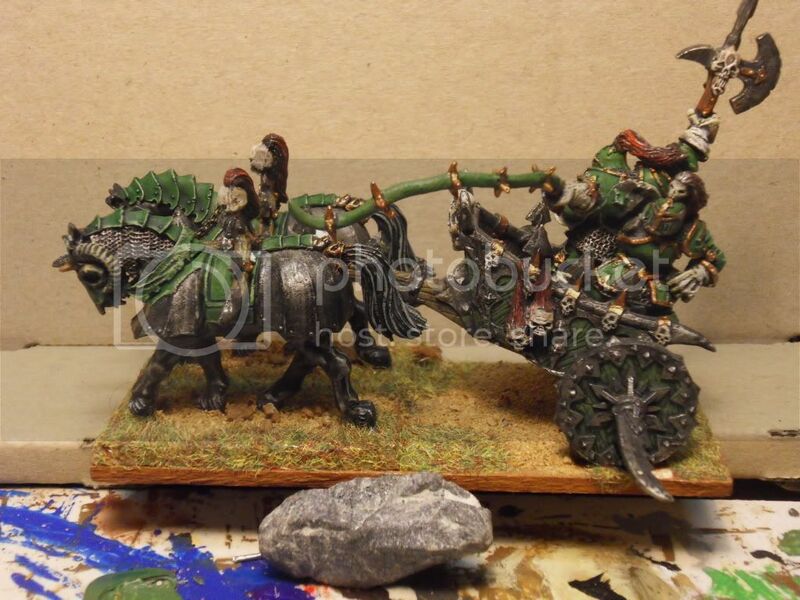 I liked the green warriors so much I had to give this unit a chariot to support them. I really wanted the blue one to be brighter then it looked so I started adding blue and just kept adding blue until I nearly covered it all. I still need to do something with the scythes at some point. Well off to bed. After the BIG Allies tournament I also keen on running a disk, I�ve got a couple. 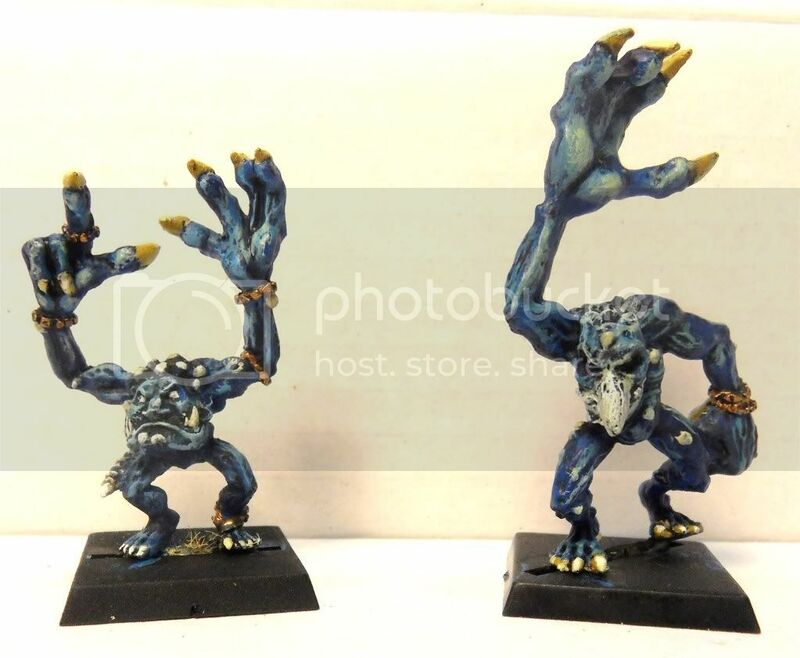 Well I�ve managed to find some time to get some more painting done. The motivation came from preparing for a 5000 point a person allies game next weekend. 20,000 points on the table it should be amazing. So I started working on the heroes. The army is taking a new theme with Char moving from undivided to the worship of tz. 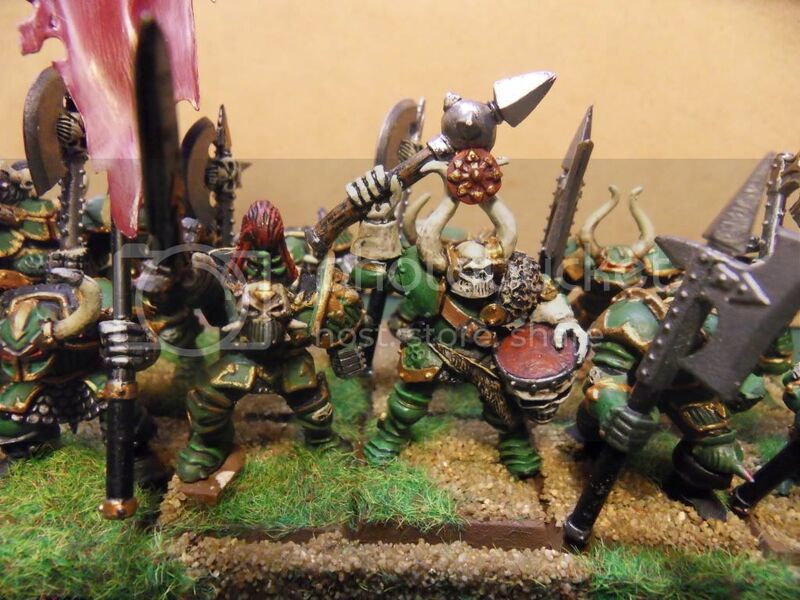 Char�s followers will make the largest part of the army but Char is not averse to using the war bands of others to do his dirty work and build his forces. 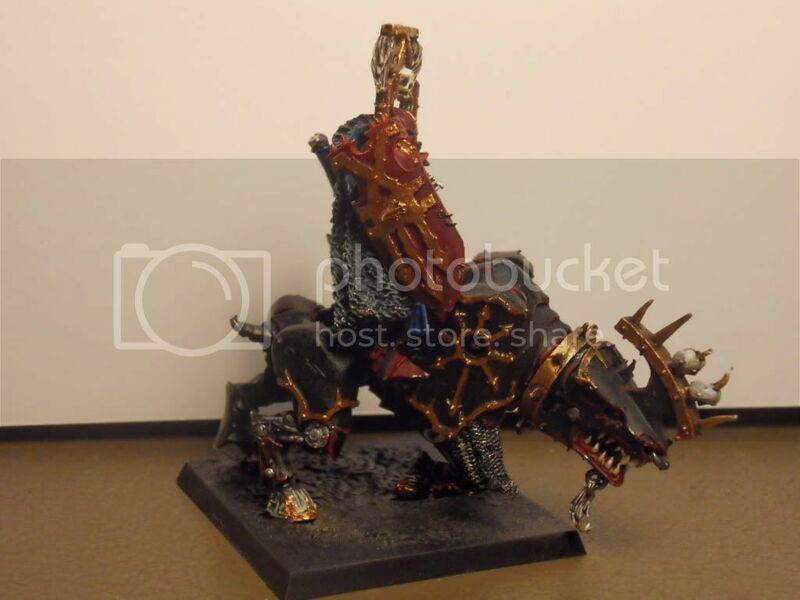 Char�s old second in command Smelt has not returned to him but he has picked up a new champion, a follower of khorne. He rides a big jug which, Char is very impressed with. 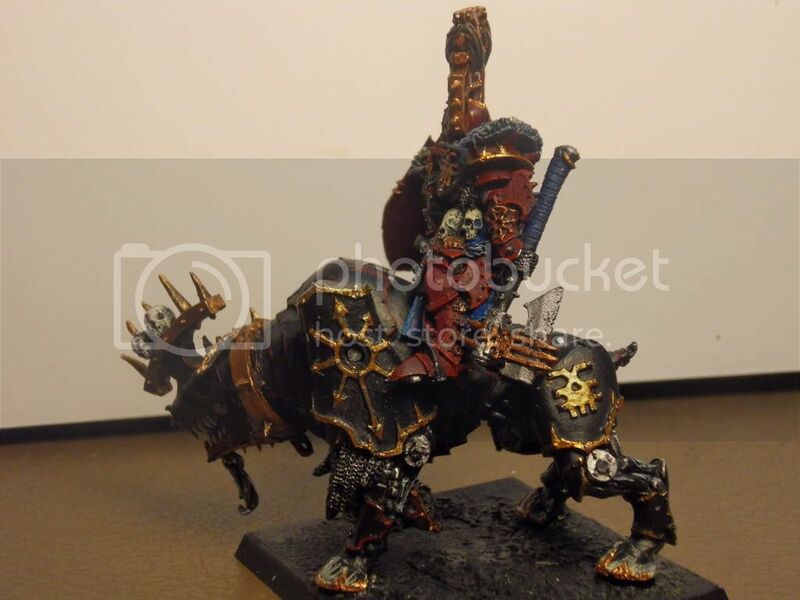 So I started with this cool new model I picked up. 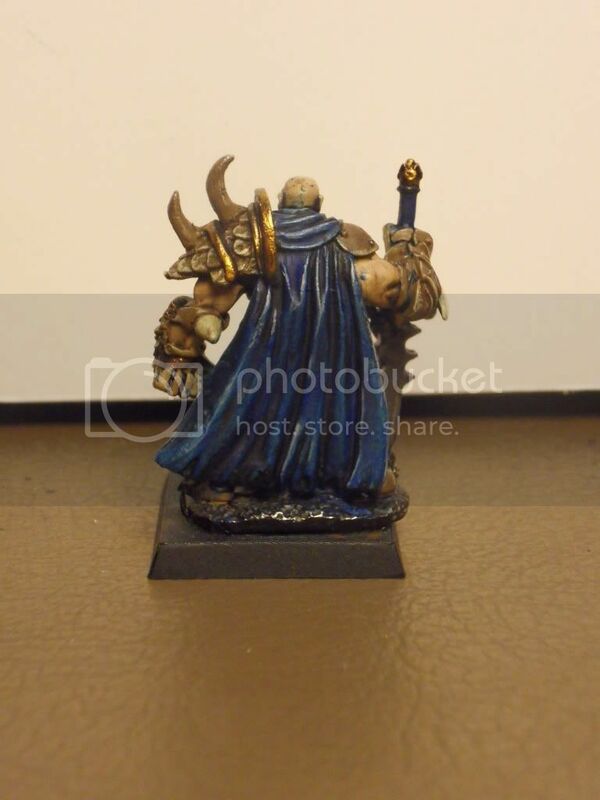 It was so quick to paint I did it in one night with the washing and highlights included. The Jug is all but finished I just need to add the spikes and skulls. I�m thinking of dropping the shield as he has a 1+ save with chaos armour and the jug so you don�t use the shield. It means I can run him with a halberd for +1 strength for just a few points, instead of using the SoM. I also made some progress on the BSB. 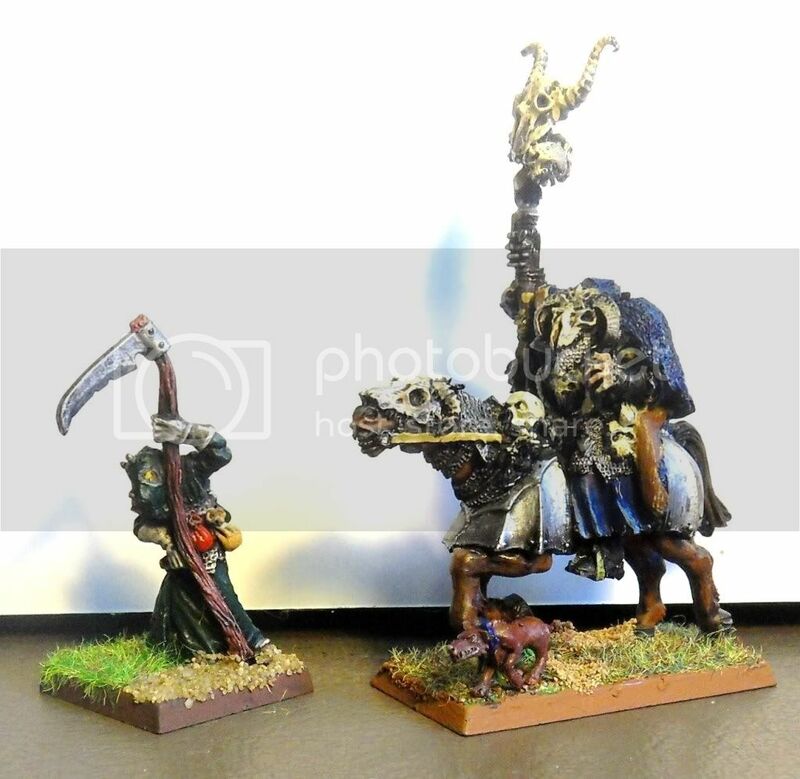 With all my units having flag type banners, I thought the BSB would need something different, so he got a skull. This has only just been added and needs highlighting but it does make him stand out in any unit he goes in. I picked him up without arms or a head so these are all add-ons. There have been numerous combinations from the bits box and it was only after he was finished that I decided on another combination and this is what you see here. The markes on his breast plates <- and < spell Char in Chaos. I dragged out a couple of my old wizards, they definitely require some attention. I should be able to move this up to table top std fairly quickly. 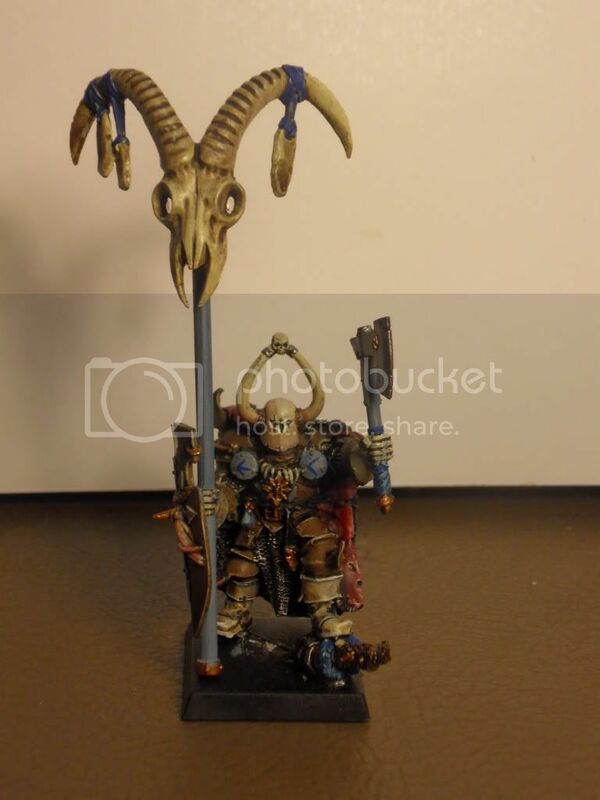 Also have a daemon prince I got just before the new chaos book. He has only had a few runs in 7th and next weekend will be his first run in 8th. 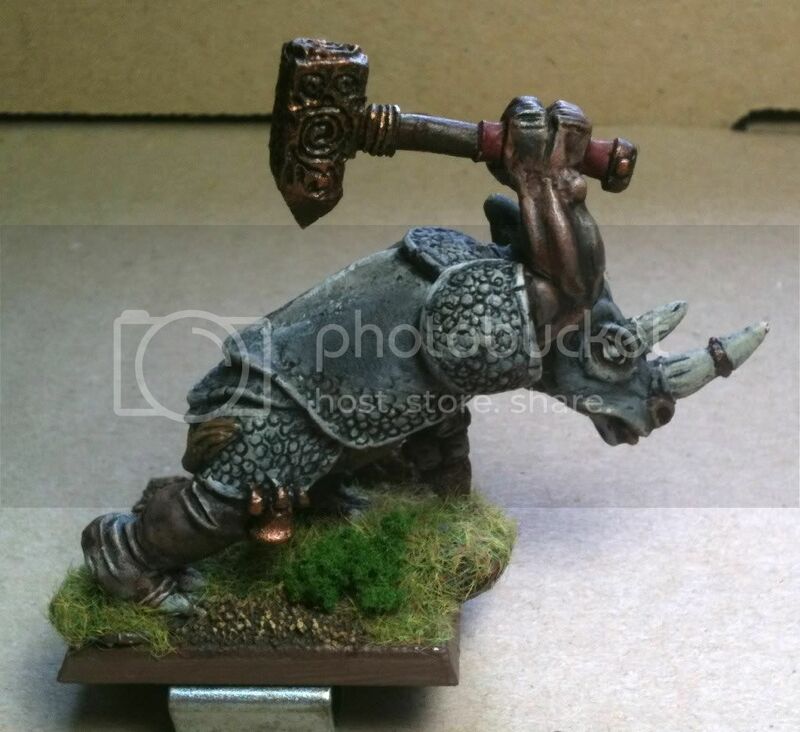 The rhino will be added to my ogres. 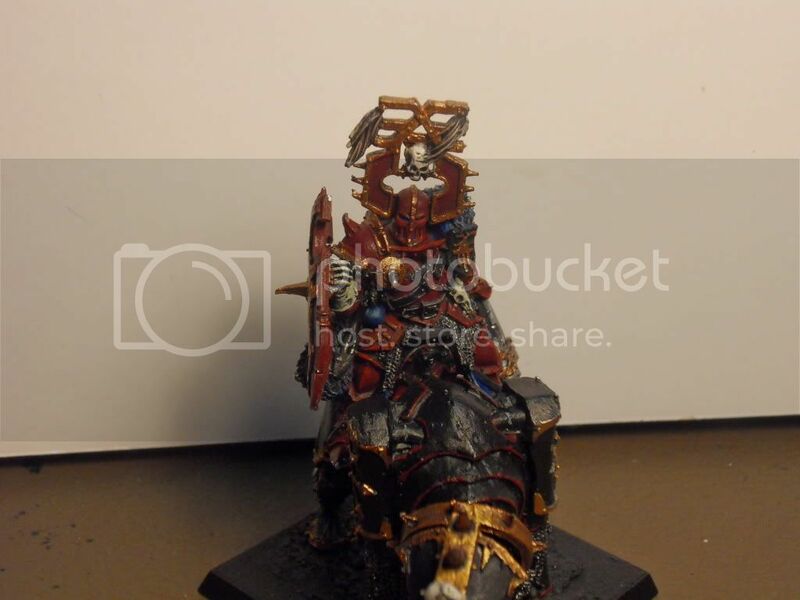 I’m looking for suggestion as to how I might paint him up. I just keep looking at him and seeing grey, this does not inspire me. 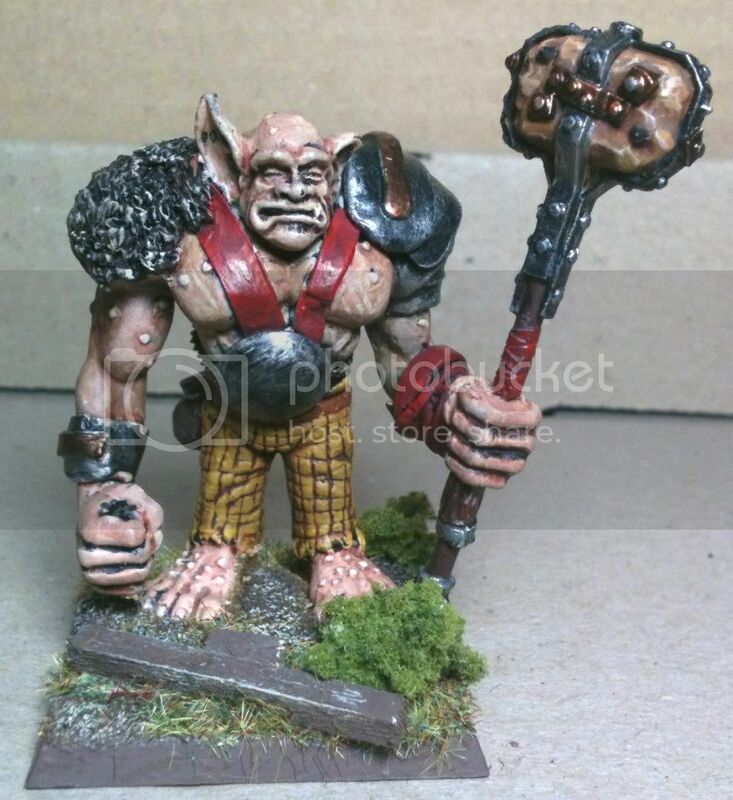 The ogres are usually run nurgle. After a recent tournie where one of the chaos players ran a Tz disk I got the bug. I have three in my bits box. So here he is, the disk still needs some highlights. 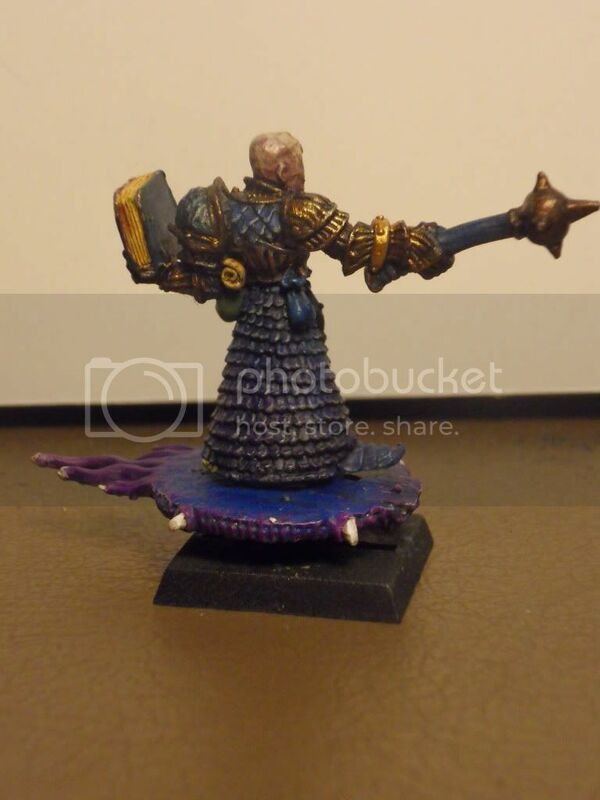 I have it on a 25mm base so I can run him on foot, but I came move him to a 40 as I have magnetised the disk. 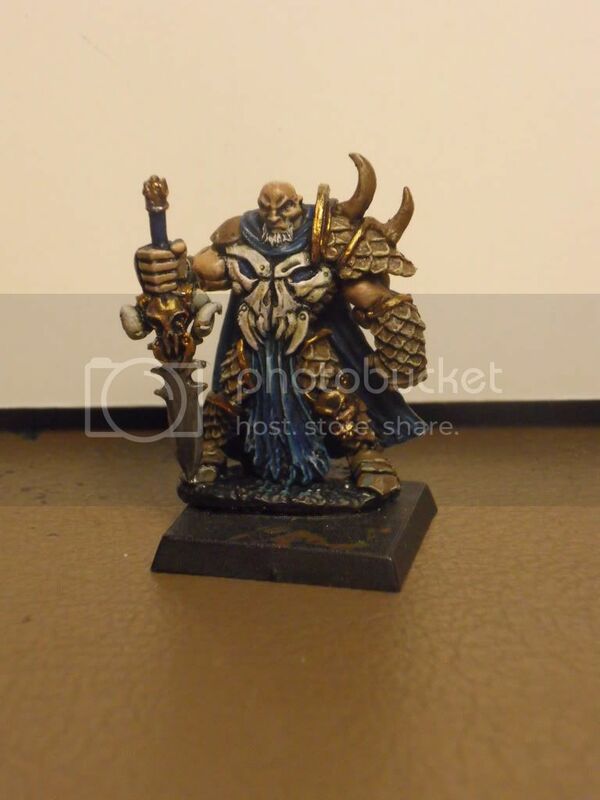 I plan to use him to go war machine hunting and latter in the game get off some rear second round charges. So these should keep me active for awhile. But I can hear the drop pods calling. This is my greatest enemy when I paint; I’m always in a hurry to start the next project. So many models. 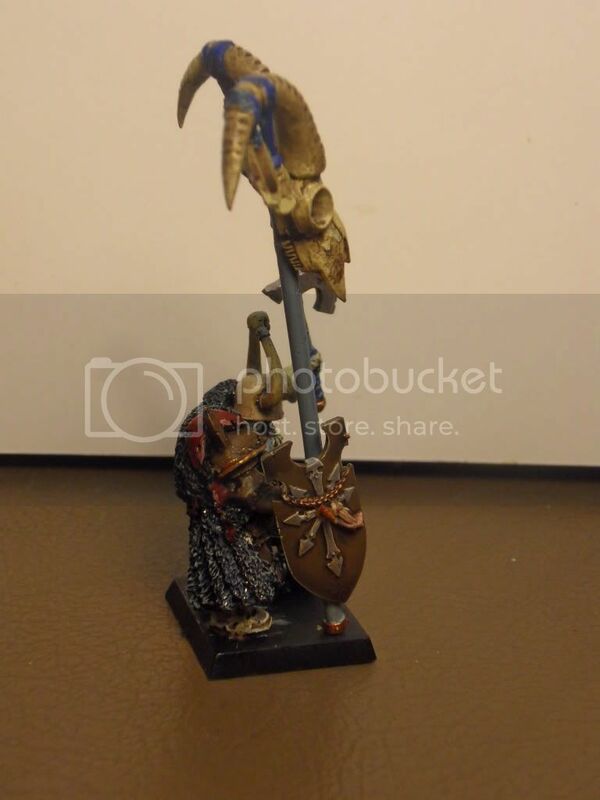 A quick update before I go to bed I�ve been working on the War Shrine tonight, well just the horrors. 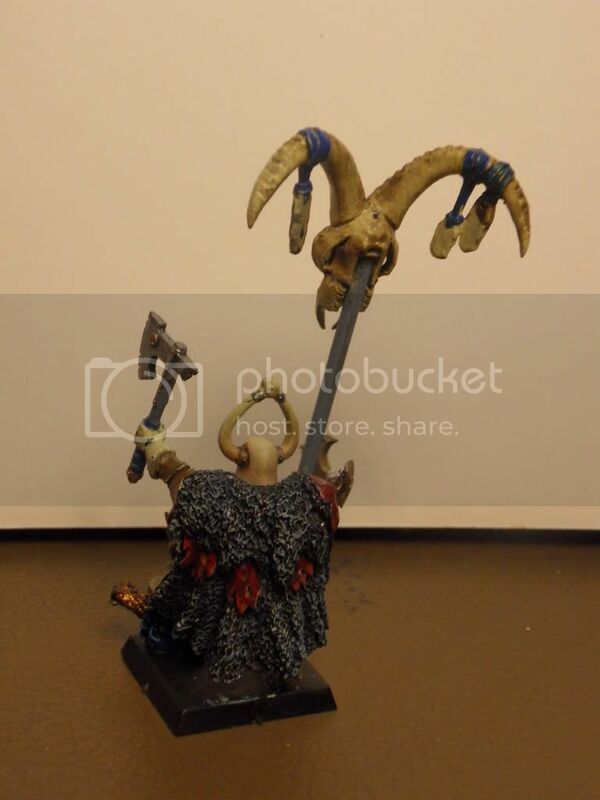 The shrine will be pulled by 2 horrors, because I have plenty of horrors from when I could run a mixed chaos list and because I always run a Tzeentch shrine. So here they are. 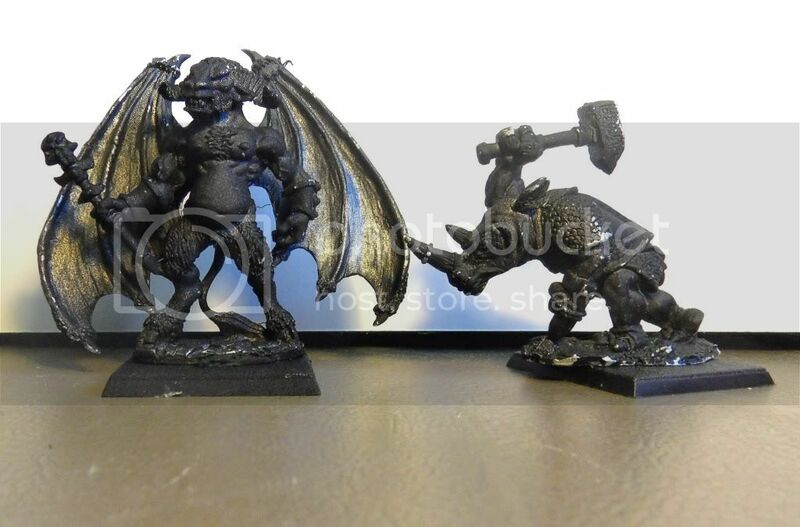 I always find little imperfections when I see the photos, they are so much bigger then the models. Maybe I need new glasses?? I have a tourny coming up so I need to get the army fully painted. I have washed and dry brushed all of the bases so they are no longer just sand. 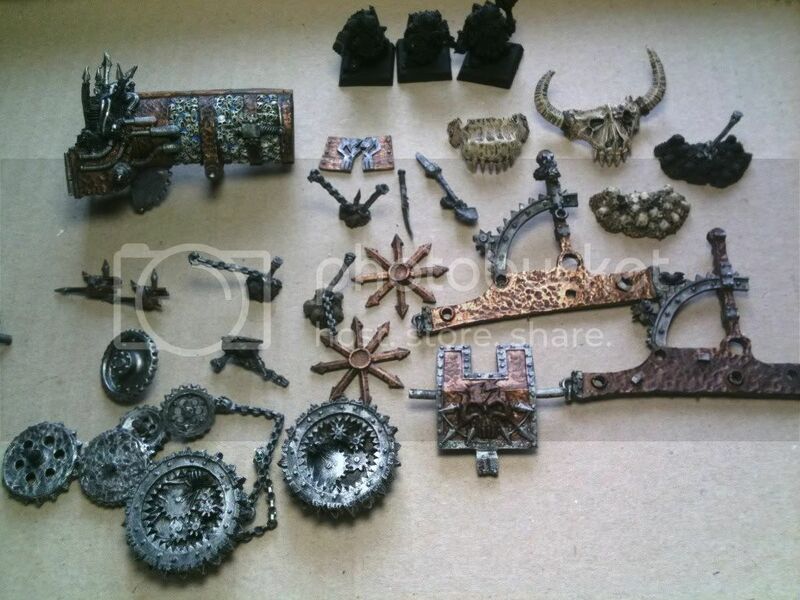 Here are the hellcannon my parts shot. I�m up to the washing stage with the copper bits so you can see the difference between the two supports, one has been highlighted the other just washed. 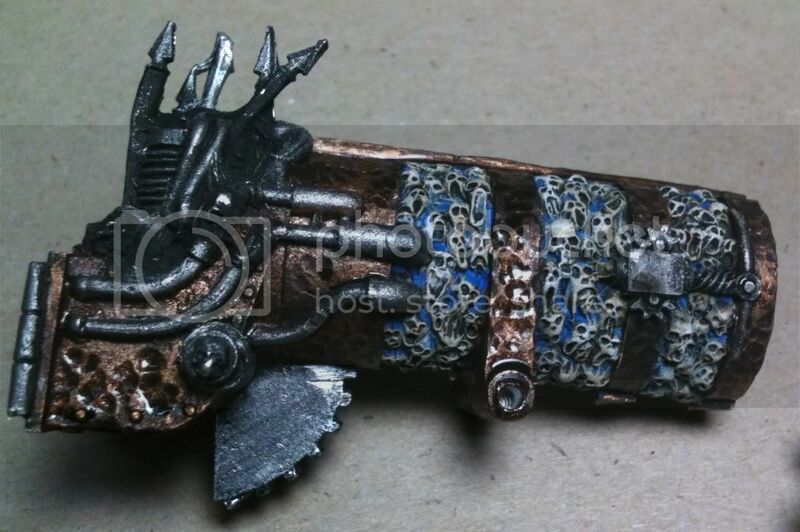 I went with a blue background for the skulls on the cannon, I tried a few combinations and this one gave a the effect. 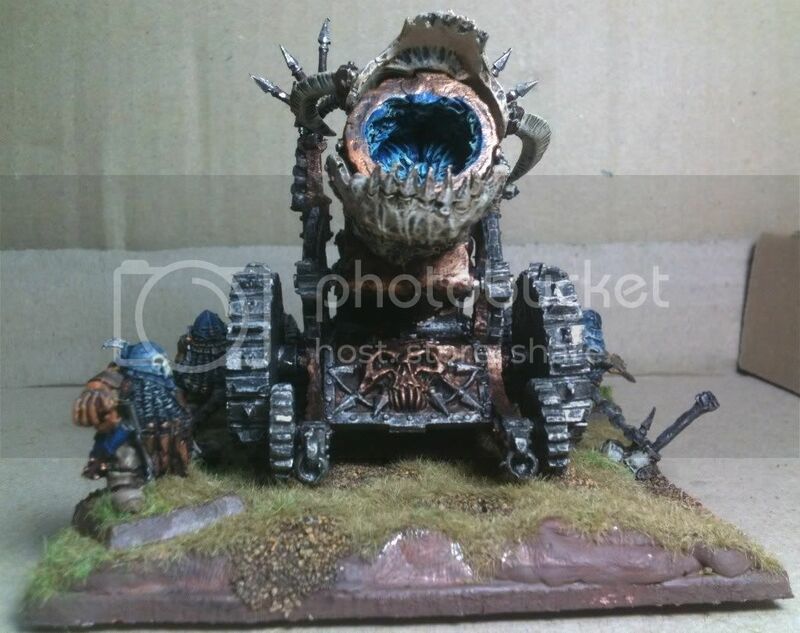 I finished the shrine, I eventually turned the horrors around to give the impression they are casting the funnel. 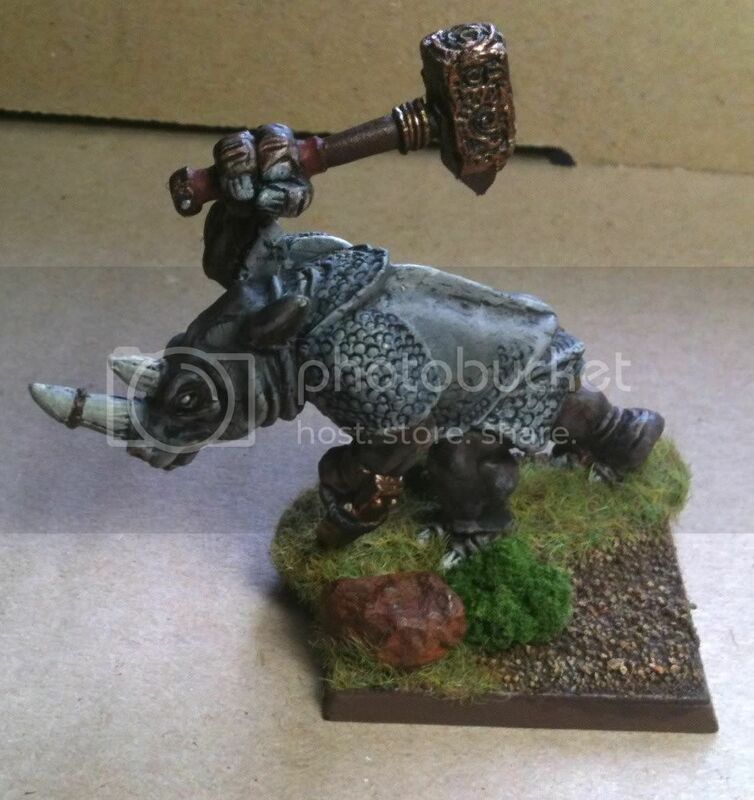 Here is the rhino to go with the golfag ogres. 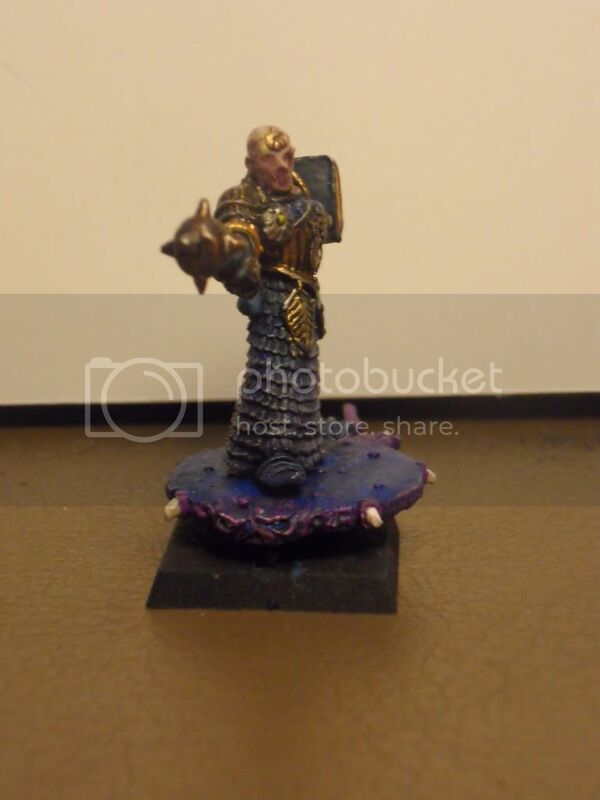 I�m very happy with how he came out. The few times I have run him he always draws some attention. 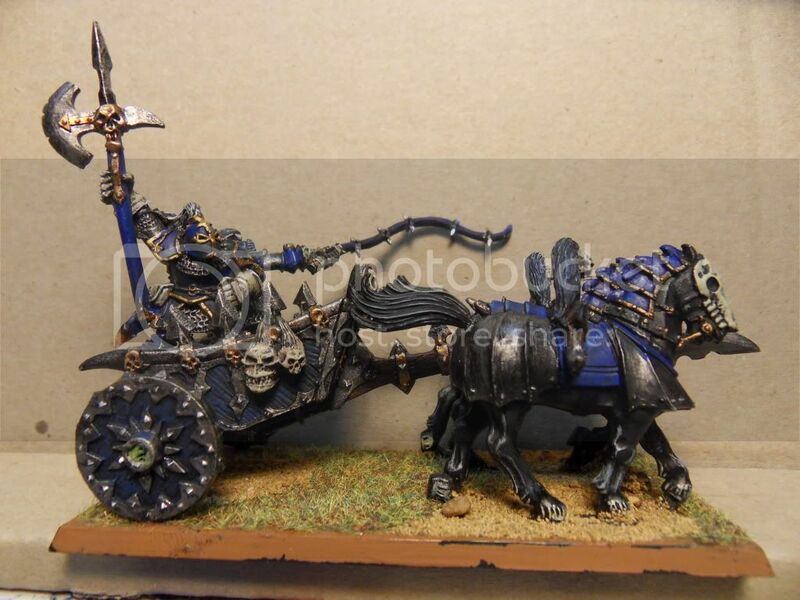 When to alter is done the army will be ready. Well the painting part is mostly done just the basing and 2 crew to go. I have put it all together to see if I like the outcome and I’m not entirely sure I do. 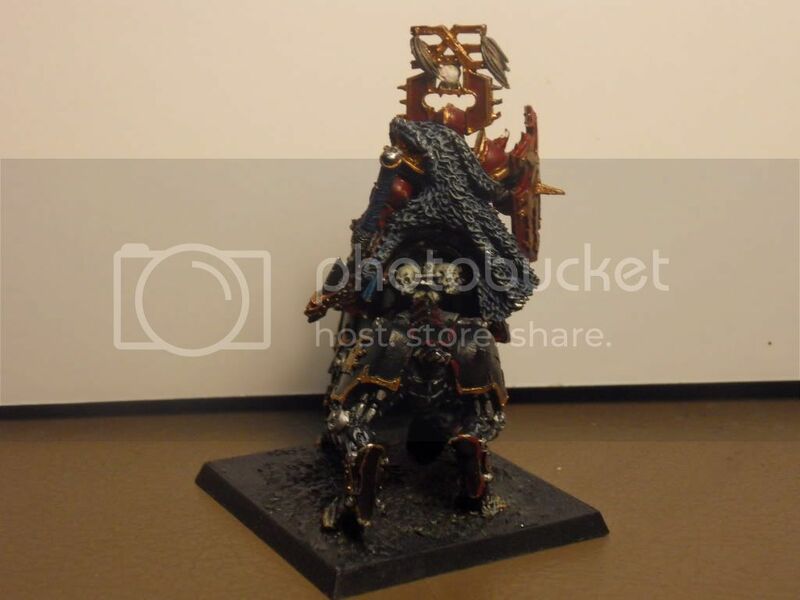 I think there is too much steel on the bottom which disrupts the look of the model. I am looking at adding more bronze to the wheels to help balance the top and bottom. 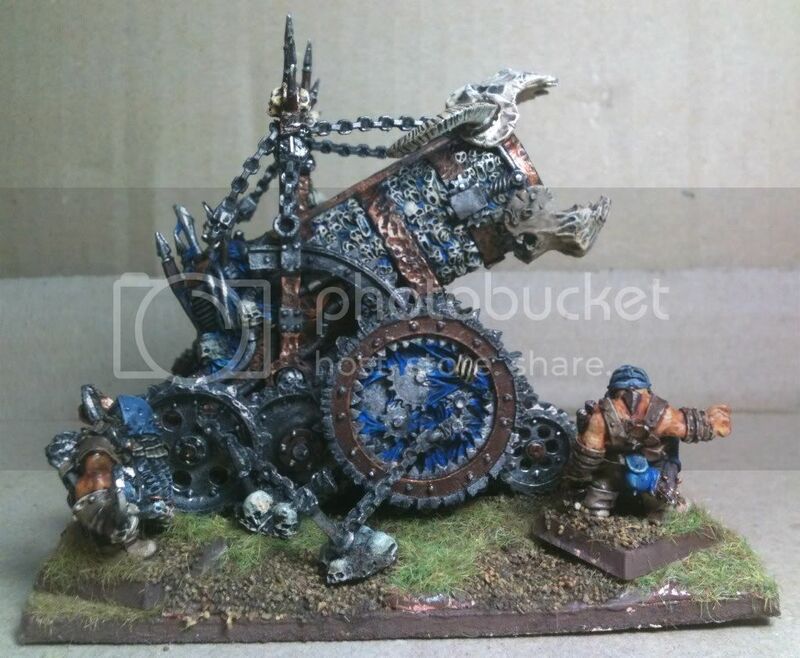 I am also not keen on the chaos star which I think blocks all the detail in the big wheel so it will go. Any other thoughts before I seal it and glue it together? Yeah blue looks sweet. 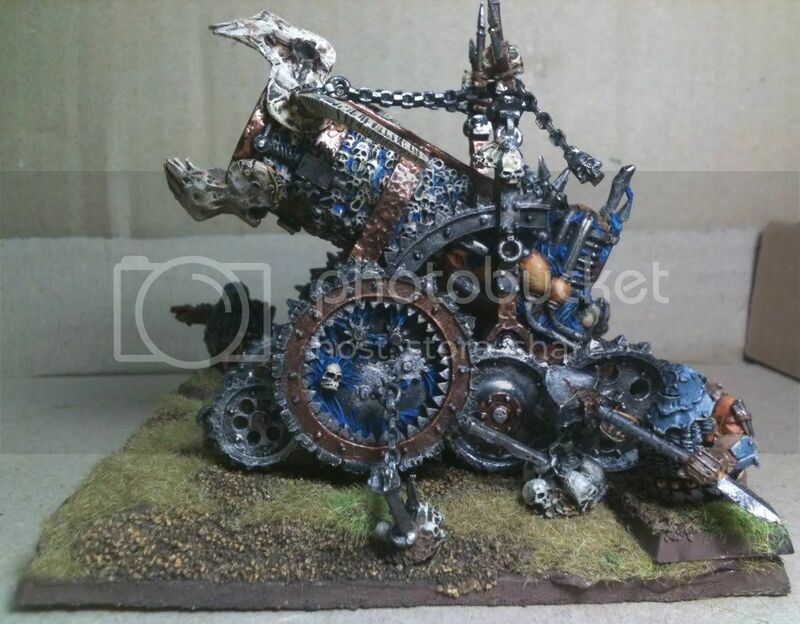 I agree with the too much metal on the wheels. Dirty it up with some browns, as if it had been rolling through the mud. In the final stages of basing the model, just a few touchups and securing it to the base. 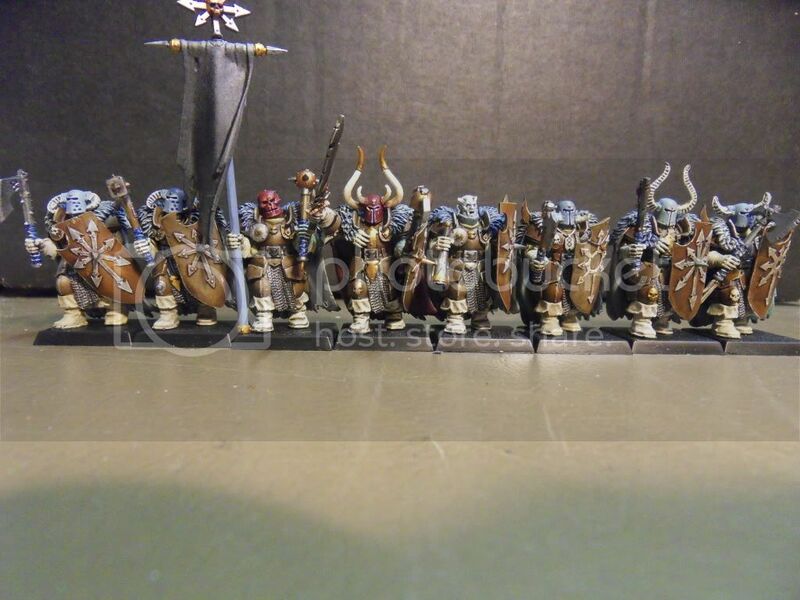 I've just found out I need an army try for the tournament so that is the next task. 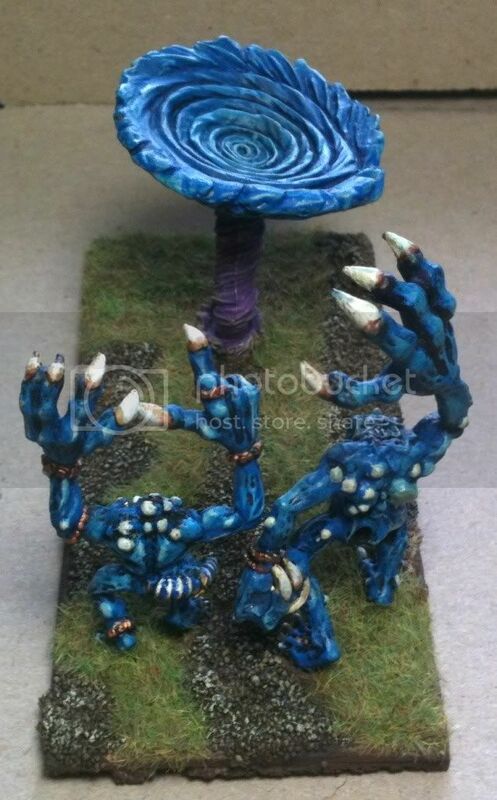 I know I’m supposed to be doing my dark elder but I’m not getting many 40k games so the inspiration is wanting. 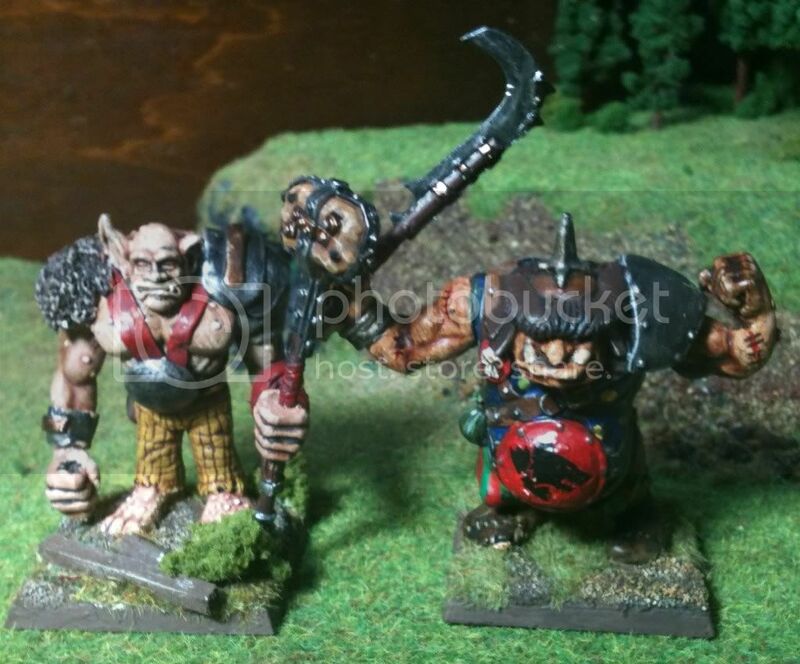 I have been playing my WoC and after having to run my ogres as 2 hand weapons at the BIG March tourney, I decided it was time to convert them. 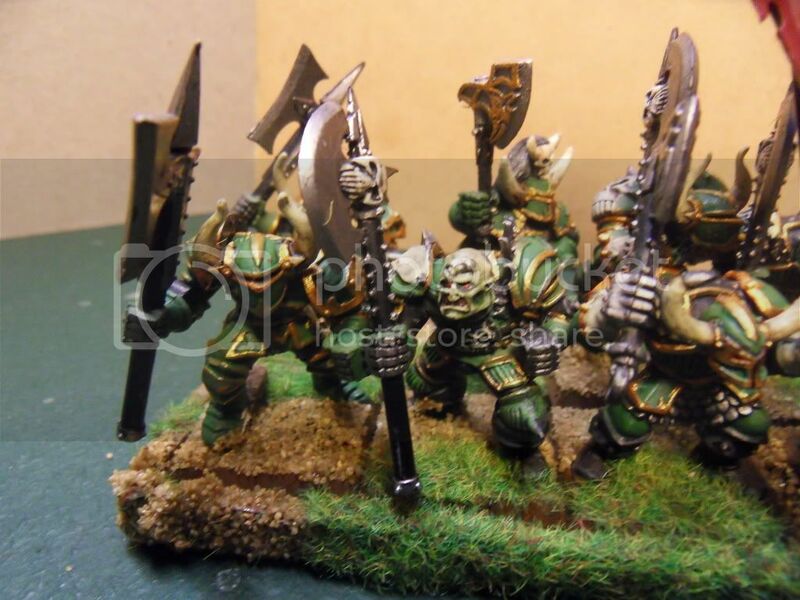 I have the old Golfag Ogres and have added a few others to them recently. The Rhino is shown above. Here is the command which will remain the same. The Rhino is tacked on the left. Here are the 4 converts. 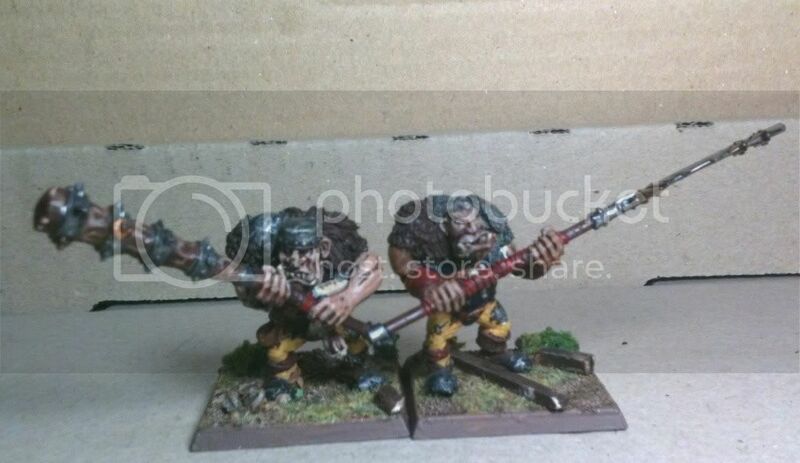 The 2 converted Golfag Ogres. 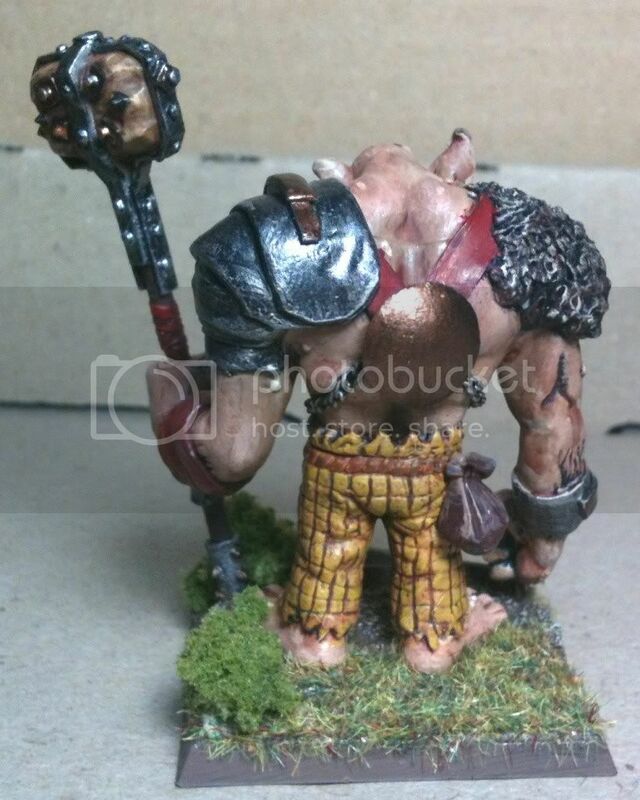 I used great weapons and some arms from the new ogre kits. The shoulders are covered in either green stuff chain or fur. This made fitting the arms a lot easier. 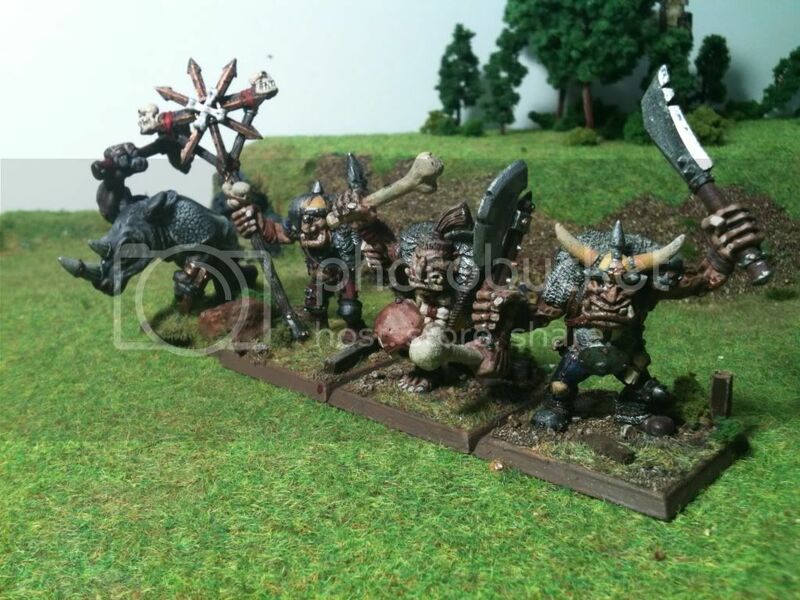 The other 2 converts, the old marauder ogre on the right got a weapon swop from the new ogre kit. I like this much more then the mace he had before. The last convert is fairly heavily green stuffed. The only original item on him is his pants. 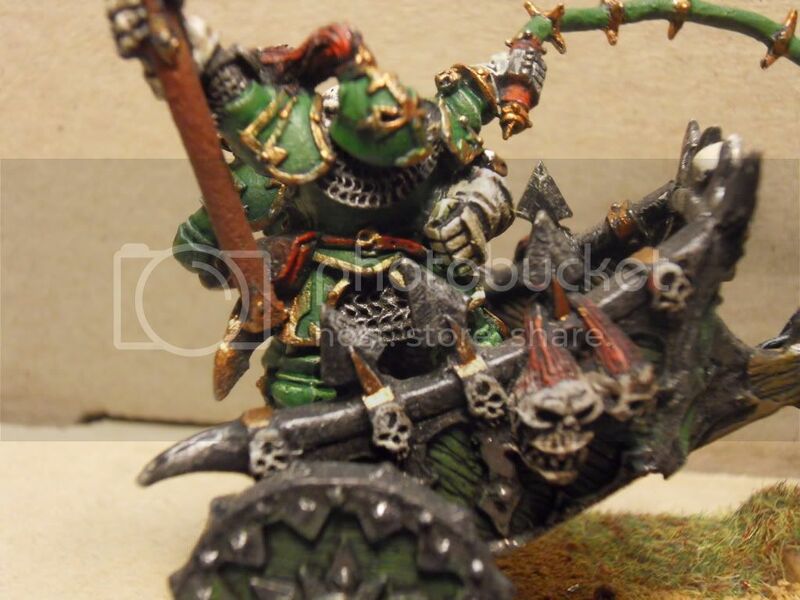 The weapon is again from the new ogre kit, almost everything else is green stuff. I just kept adding and adding every time I sat down at the table.